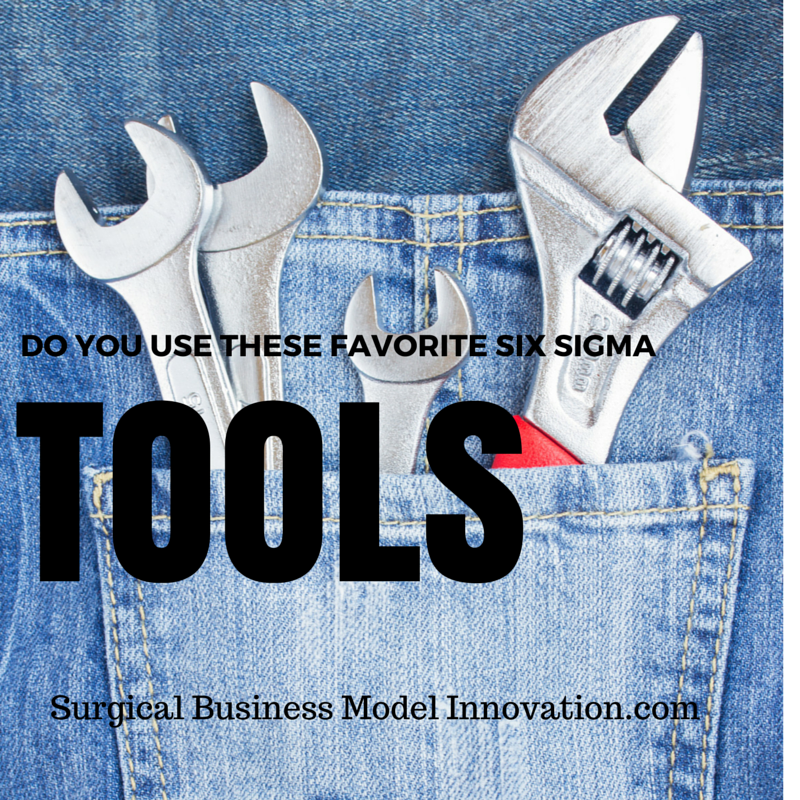 Do You Use These Favorite Six Sigma Tools? Posted on June 8, 2015 Author David	No Comments on Do You Use These Favorite Six Sigma Tools? Lots of courses in statistical process control focus on the tools and how to use them. A few have gone on to say that, once you are comfortable with the tools, you can pick and choose specific elements to achieve the team’s goals. A recent survey even described which of the Six Sigma tools practicing black belts used routinely. In this entry I will share with you my favourite elements that I usually string together as part of a project. Are these the same tools you routinely use? In the brief survey I looked at, the project charter was the most commonly used tool. Why? I like to think it’s because the project charter makes a very clear case for why the team should bother doing what it’s doing. It puts forward a cost of poor quality assessment and that strong financial case, in addition to the clarity it brings, really lets the team know how waste impacts the organization. So, like many practicing black belts and master black belts, I have used the project charter for each and every one of the more than 30 projects I have completed with teams. I also routinely use a SIPOC diagram. The SIPOC diagram helps me prevent some of the typical reasons why a project fails. One important reason why a projects are unsuccessful is something called Scope Creep. I have described Scope Creep previously. Here, let’s just say that Scope Creep is having an unclear scope that tends to grow with the project. It can also occur when a project bites off more than it can chew. Having it define a clear scope is very useful and the SIPOC diagram helps to do this. What does SIPOC stand for? It stands for suppliers, inputs, process, outputs, and customers. The process portion is the usually the part I help the team complete first. We usually go for five to six high level steps to demonstrate how we get done what we do. These are framed by the project scope and these process steps do not go beyond the project scope. SIPOC diagrams are very useful for clarifying who eventually are the customers for the processes output, and whether they are internal or external customers. It also focuses on how materials, patients, or other inputs come into the process. I’ve found the SIPOC diagram helps get everyone on the same page for my next favorite tool: the data collection plan. Data collection plans are great because they compel the team to come up with an operational definition for each data end point. It’s amazing how much variation there can be even within one organization for the different data end points that it is measuring. Also the data collection plan helps us build a sampling plan so that we know what size sample we need and how to best get at it. Finally, the data collection plan helps the team understand which portions of the system it will be reviewing and ensures that the team gets process, input, and output measures. There is no really one tool for this portion of the DMAIC process. I do like to share, however, that processes in the real world sometimes do not follow the normal distribution. Therefore, software packages are very useful for using some of my favourite data tools, including the Box Cox transformation and other tools that work with non-normal data sets such as the KW Test, Levene Test and Mood’s Median Test. These are some of my favourite Six Sigma tools and I think back to that article where black belts described their most commonly used tools. It was surprising to me that the article was all over the map in terms of which specific tools black belts employed when completing projects. Which tools do you use in your practice to achieve the different tollgates and get the highest quality outcomes? Get in touch and let me know as I am always interested to hear from black belts around the country and the world. Previous Previous: Have You Ever Used Stealth Sigma?